After a smashing “Recording Party” on Monday night / Tuesday morning at Revolver, Suckmusic is back at Revolver this Friday with another installment of the Suckmusic & Friends parties. 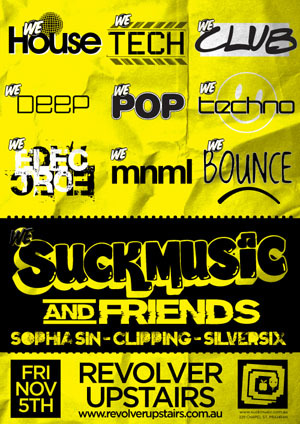 Suckmusic members will receive free entry as always, while discounted entry is still available for everyone else using the ‘Suckmusic‘ open list. The back bar plays host to regulars Mike Callander & crew as per usual. See you in the front bar xoxo.